I used Zoya Savita matte for the jacket, mixed with Sally Hansen All the White Stuff for the lapels, and again for the purple on the shirt. For the white of the shirt, I used OPI Alpine Snow Matte, and for the bow tie I used China Glaze 2030 from Khrome Collection, then mixed with China Glaze Liquid Leather to shade, and tehn topped it off with Essie Matte About You to dull down the shine of the Khrome. "Invention, my dear friends, is 93% perspiration, 6% electricity, 4% evaporation, and 2% butterscotch ripple. " Oh, and the snozzberries DO taste like snozzberries. LOL snozzberries.... THAT brings back memories! Soooooo great! You're so talented! This might be my favorite design ever! I looove Willy Wonka. you can bet I won't get that song out of my head for the rest of the day!! The nails are soooo cute! I love this! You come up with the BEST ideas- so much fun! I LOVE the Zoya Savita- but I'm vexed because I keep missing out on CG 2030- my Sally Beauty had it, then didn't, did, didn't... gotta find it online. The texture of his jacket really comes through on your nails- it looks 3D! Super kool. 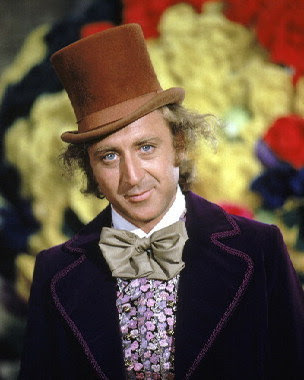 Plus, I feel the same way about the original Willy Wonka movie- and in spite of loving Johnny Depp as I do, even HE couldn't hold a candle to Gene Wilder as W.W. !!! 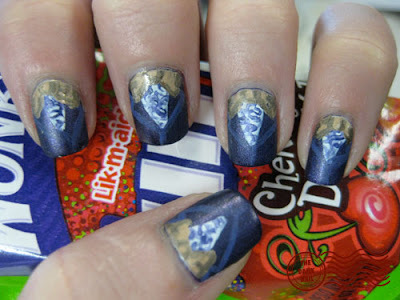 Oompa loompa doobidy dee, if you are wise you'll do nail art like me! Yay! Thanks for the link! I forgot about them! Omg. That is one of my favorite movies and I absolutely LOVE your nails. You have such great ideas, I would never think of them! ahahaha thats awesome..although it brings up bad memories of oompa loompas. THEY'RE FRIGHTENING!!! That is one of my favorite movies and I absolutely LOVE your nails.